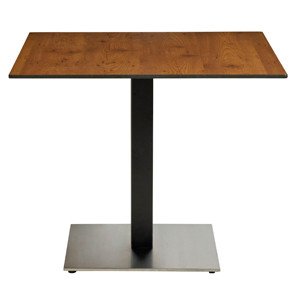 These slim profile, 36" square, high pressure laminate (HPL) cafeteria table tops are designed to go with the contemporary style pedestal base, aluminum tilt top folding base 200, or bar height tulip table base. The contemporary pedestal base features a two-color style for a more upscale look with a stainless steel base to resist corrosion and scuff marks. Easy to clean and easy to assemble using just screws. Adjustable glides designed specifically to eliminate wobbly tabletops. 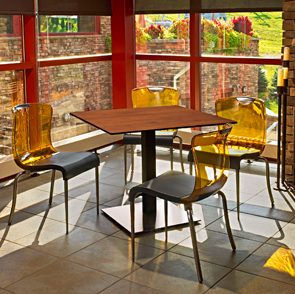 The strong and sturdy HPL table tops are resistant to common environmental risks such as UV rays, scratching, burning, staining, and high heat. Table pedestal height measures 29".